Angelo Renna (Florence, 1985) studied at the Faculty of Architecture of Florence (Unifi) and at the Architecture School of Porto (FAUP). He collaborated with different offices such as Stefano Boeri Architetti in Milan, Bureau A in Geneva and Topotek1 in Berlin. In 2011 he won the 3rd prize in the competition ‘d3 Housing Tomorrow 2011’, NY (USA) with the project ‘Learning from slums:Ilhas, Portugal’. The project was exhibited at 1point618 gallery in the historic Gordon square arts district of Cleveland, New York. 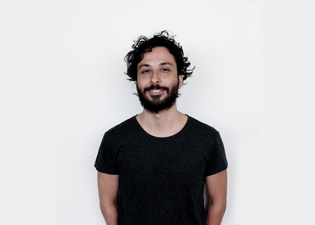 He has been selected as one of the 8 Italian architects to participate at the exhibition “Giovani architetti grattano il cielo”, Casabella and in 2013 he won honorable mention in Domus Competition for Archivo Pavilion, Mexico. In 2013 he won (with Ugo Office) Europan Norway with the project “1.2.3 stella”. He actually lives and works in Berlin.